Hi, CSI Project readers! My name is Brittany (aka Pretty Handy Girl). Normally I don’t look this clean. I usually have sawdust in my hair or paint splatter on my elbows. 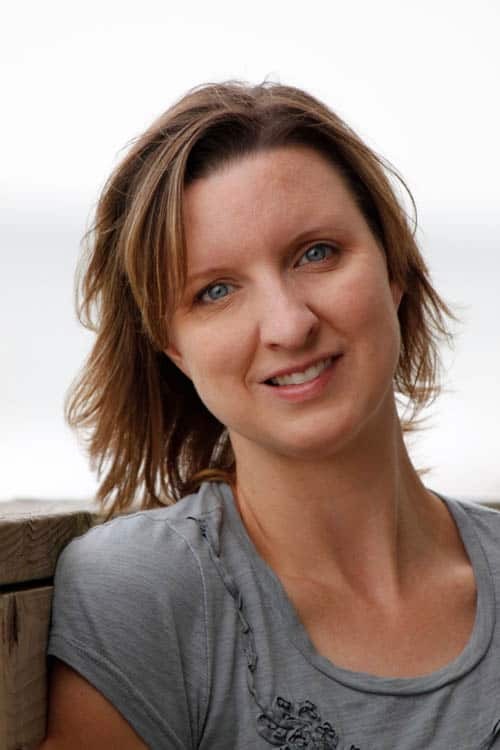 I write a blog full of tutorials for everything from crafing and sewing to building and home repairs. Today I have a tutorial for making a bench cushion with piping. Before we get started I wanted to let you in on a little secret: The bench cushion and side table fabrics you see below are actually shower curtains! You read that right. Shower curtains are not only inexpensive, but they are durable and can stand up to moisture. This makes them perfect for outdoor use. I bought both of these at Target for under $20 each! 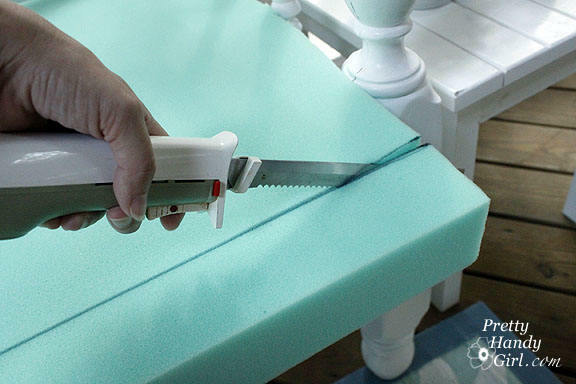 Lay your foam on top of the bench. Mark a line where you need to trim. Use an electric carving knife to cut through the foam. Wrap batting around your foam. Then trim the edges down to size. I had enough to put two layers on top of the foam and one layer on the bottom. This will make for a cushier and less “squared” cushion. 1. Lay out your fabric (err, I mean, shower curtain) folded in half. Place your cushion on top. Trace around the cushion about 3/4″ wider on all sides. Cut through the two layers. This will give you the top and bottom panels for your cover. *The back is wider and has two strips because we need to sew an overlapping flap and velcro to make the cover removable. 1. Wrap the 4 strips around your cushion right sides facing in. (Reserve the back fold over piece for later.) Pin the edges where they meet at your cushion corners. The back strip should line up with the sides on the one edge. But, the other edge will extend 1.25″ taller than the rest. 2. Remove the sides and stitch where the pins are. When you get to the back strip, fold over the excess so it matches the same height as the rest of the strips. Then stitch along the back strip’s folded over fabric to secure it. Set your sides aside for now. It is time to pin the piping to your cushion top. 1. Lay the top panel right side up on top of the cushion. Pin the piping on top of the fabric. Line up the piping with the edges of the cushion. Be sure the raw edge of your piping is facing the raw edge of the fabric. When you reach a corner, snip into the raw edge of the piping all the way (but not through) the rope piping. Then turn your piping at a clean 90 degree angle and continue pinning. 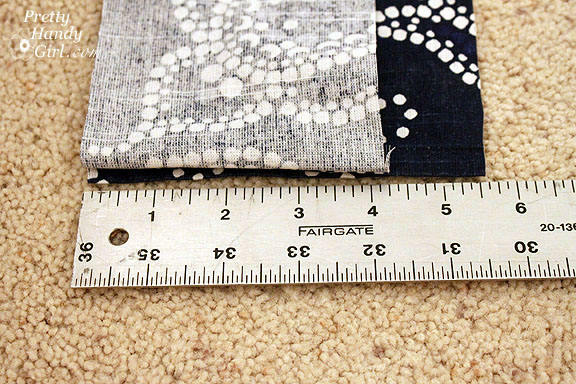 When you reach the beginning of your pinned piping, simply overlap the two about 2″ and cut off the excess. 2. Set the top panel on your sewing machine and sew the piping into place. Your needle will be very close to the piping, but it shouldn’t stitch into the rope. This is where your zipper foot really helps! 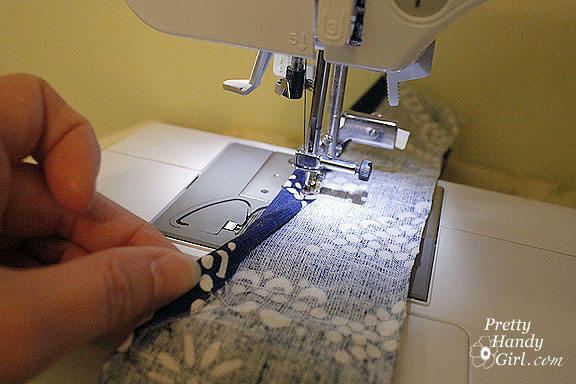 Carefully sew and backstitch over the place where your piping overlaps. 1. Lay your top panel onto the cushion. 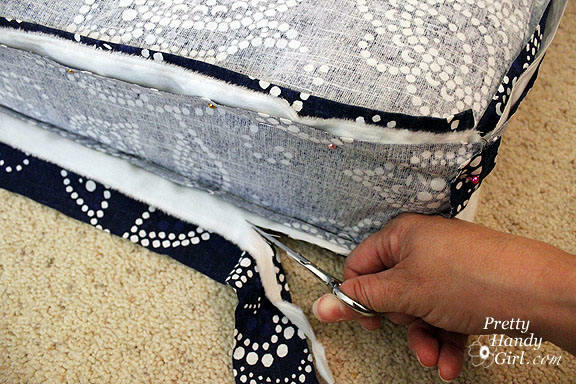 Pick up your sides and begin pinning them to the top of the cushion. The hem on the back side should be facing up and away from the piping. Position your pins close to the piping but not on top of it. Try to line up the corners of your sides with the 90 degree corners of your piping. Turn your top cover right sides out and test the fit on your cushion. 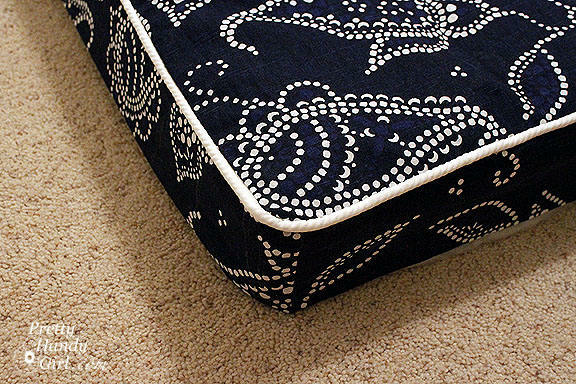 Repeat the steps above for “adding the piping” for your bottom cover. 1. NOW, pick up that back fold over strip that has been sitting all by its lonesome. Fold the edges over twice on three sides (2 short and 1 long) to hem your flap. Press the hem with an iron. 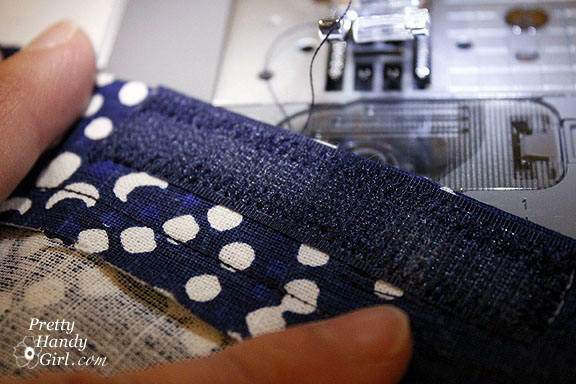 Go ahead and stitch along the folded hem to secure it. 2. Center and pin the flap along the back edge of the bottom panel (right sides together) as shown. The raw edges should be facing out. 3. Stitch the back flap onto the bottom panel next to the piping. About an inch or so of the panel will extend on both ends. Leave it loose so it can tuck inside the cushion. 3. Turn your top panel and sides wrong sides out and put your cushion inside it. Then lay your bottom panel on top as shown. Ever so carefully, peel the pinned cover off the cushion. 5. Stitch along the two sides and front of your cover. Leave the back length of the cover open. Remember, use your fingers to feel for the piping. 6. 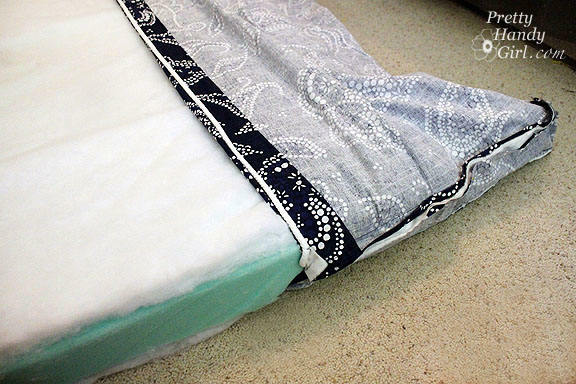 Turn the cover right side out and slide the cushion into the cover. Check the fit and make sure you don’t have any stray fabric that might have gotten caught while sewing. You should have an opening in the back like this. 1. Take out your coordinating velcro tape. Pin the hook and loop velcro tape onto the back side and the back fold over flap. I used 4 strips of 3″ velcro evenly spaced along the length of the opening. Check the fit of the velcro. 3. If everything looks good, you can turn the cover inside out and trim off any excess raw edges. Then turn the cover right side out and insert your cushion. And that’s it! You are done. Now you have a professional looking, washable, piped slipcovered cushion! Phew, say that 10 times fast. Won’t you come have a seat with me on our trash to treasure screen porch! And, may I get offer you a tall glass of sweet tea? Thank you so much to Amanda, Beckie, and Jen for having me over today. I can’t wait to see your sewing entries on Thursday! You can find frames for sofa beds and also style ideas for different patterns from Amazon. Oh my gosh! This is absolutely amazing. you did a fantastic job! Love the tutorial. Great instructions, fabulous photos. A shower curtain? Get outta here, why haven’t I thought of that. It would be a whole lot cheaper that Sunbrella fabric, for sure. I have a tip for you. If you put your foam insert inside of a garbage bag or some type of plastic bag, it slides in much easier. I tend to get my stuff pretty snug, so the bag helps me out. I have a twin mattress under by beach house, waiting for the hubs to make me a swing bed. Target, here I come for a couple of shower curtains. I could make a fitted sheet with those for underneath my house, hmm, pillows too. Thanks for the tips. … I love the seat covers… but I love the bench too… it looks like it was made from an old bed? Did you makeit? How much fabric do you use per cushion. I’m ordering the fabric online so I just want to make sure :).